Warning: This is not an uplifting post. A couple of weeks ago, I visited two different Wal-Marts, once out of necessity (in Cody, Wyoming) and once because I was dragged there (Virginia Beach). While I didn't completely scour the stores to examine every item for its eco-friendliness, I did notice a few things which irked me. In 2001, Wal-Mart became the largest food retailer in the US. If all (or even most) of their produce is conventional, they are contributing to a health and environmental disaster. Conventional farming methods rely on pesticides, herbicides, and synthetic fertilizers for production. The run-off of treated soil and nitrogen fertilizers has led to the huge dead zone in the Gulf of Mexico (a simple explanation, here and here). Not providing customers with the option of organic is definitely not green. In the Virginia Beach Wal-Mart I thought I'd check out the meat department. I thought I'd see at least one organic or free-range meat product -- chicken at the very least. All I saw was unsustainable chicken, beef, and pork. These animals are most likely from a factory farm, which in itself is an environmental nightmare. Cheap at any cost simply cannot last. As the world's demand for cheap goods (and cheap labor) continues, China -- the world's manufacturer -- is running out of natural resources. Not to mention the abuses of workers' rights, and disregard for human rights in and out of the country (ie, Sudan). So, why do I hold Wal-Mart responsible for all of this? Simply because they have the greatest reach of all the big box stores. And according the National Geographic, 9% of all Chinese goods imported to the US end up on Wal-Mart's shelves. That might not sound like a lot until you really think about it. Think of the hundreds of thousands of retailers in this country. Now think about the piece of the China-goods pie that's going to Wal-Mart. It's staggering. It's not like they're doing nothing at all to try to be more sustainable. In 2005, Wal-Mart announced their goals for reducing their carbon footprint and being more environmentally responsible. They recently announced they'll be offering more local produce (probably to save money since these days local is cheaper due because it doesn't have to travel far). They sell CFLs, but soon that will be the only lighting option that can be sold by law. I'm sure I'm not covering all of the good things they have planned for the future, but I'm just not optimistic about the ability of a giant like Wal-Mart to be sustainable. 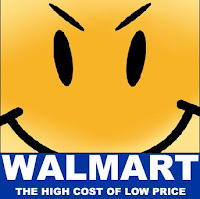 Haven't read enough bad news about Wal-Mart? Here's more about their negative enviro-impact from Grist. Want to know where to shop instead? Keep reading this blog!